Bonnie McKee is now 19 (I believe, as of Spring of 2004). But her sound is much more mature. Could be due to the fact that she’s been through a lot more in life than most women her age. She comes from a musical family and is a classically trained pianist. 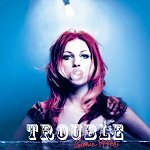 “Trouble” is probably the first single and it’s sure to gain McKee some well-deserved attention. It’s one of those perfect pop songs. It’s got great lyrics, and a beat that makes you want to move or at the very least to sing along to, which never hurts! “Someone” is also a very strong track. It’s more of a ballad and really shows McKee’s excellent vocals and songwriting skills. This young woman has a great talent for writing good solid pop songs. They’re full of emotion in both the lyrics and the instrumentation. They can be embraced by lovers of teen pop and well as stogy old music purists like me. She also appears to be a great performer. She’s energetic, has an amazing voice and is gorgeous as well. Interesting side note:Bonnie McKee played Janis Joplin on the television show, “American Dreams” in 2004. Possibly interesting side-side note a.k.a. from the Peanut Gallery: I must also say that I am quite disappointed in the effort given to market this recording or lack thereof. I received my copy on February 26th of 2004 and was asked not to report on it until the release date was set. Well, I wrote the review then sat on it for several months. I wrote to her “people”, the ones who sent me the CD and my emails went unanswered. I just happened to check Amazon and now see that it is available for pre-order so I decided to post my review anyway…EIGHT months later. I really have a problem with her web site as well. It does not actually take us to anything resembling a real artist web site but this thing called Band Builder which makes you launch a player. It opens up as a “player” so you’ll be listening to her while you browse (a major annoyance anyway as it is my belief that music should NEVER be automatically launched). It is strange and hard to navigate. But I didn’t see the regular features: bio, purchase info, listen (which is there but not optional) and so on, but instead is filled with random thoughts of hers and a poll (where you’re supposed to vote what you think on songs from an album you can’t buy yet). You can see a video though, which includes interviews and song clips, that’s cool. I just hope that Miss McKee can overcome what this record company has done (or NOT done) for her and still have a successful career because I think she’s a real talent. Comment: The more I hear this album, the more I can’t believe that this hasn’t gotten the airplay it deserves. I’ve had this for months now, and still listen to it at least once a week. We’re now late in 2005 and nothing appears to be moving in the right direction for her. A real crime! Comment: I think Bonnie Mckee is a real talent that is going to “explode” on the scene once she’s gone through this bizarre marketing scheme. Her music is incredible especially considering most of it was written by the time she was 16 years old. I’m looking forward to her next album which should have her even more mature works to look forward to. The Seattle Girls’ Choir where she trained is internationally renowned and Grammy nominated. Her training is impecabble as with all the girls from that choir who reach the top level of Prime Voci. Bonnie’s drive is unstoppable! Note: I agree. She’s fabulous. I just listened to her again today and I really want her to get some attention! Comment: I’m sorry but I think this singer/songwriter is quite overrated. How much did her recording company pay Yahoo to crown her “emerging artist of the month?” While her voice is pleasant enough, her songwriting ability is lackluster, and her songs are trite. Her songs sound like something you could have heard on adult radio in the ’80s (Laura Brannigan anyone?) At one time, women singer/songwriters were cutting edge and interesting (like Alanis Morissette.) Now we have to sludge through Britney, Avril, and this chick. Marketing Departments “decide” who is going to be popular, and everybody just falls in line. Do you want to listen to women who rock? Buy a Tori Amos or Juliana Hatfield CD. Comment: Agreed, website is quite hard to navigate through and a bit on the slow side. Music from this CD is amazing though, I’d really suggest anyone looking for really “emo” music to get this. Tons of heartfelt words in it.